Laurie was introduced Bikram yoga by her 3 adult children. In August of 2013, they took Laurie to her first class in Bozeman, Montana where the elevation is 4793 feet versus 715 feet in Indianapolis! It was a class that she will never forget. 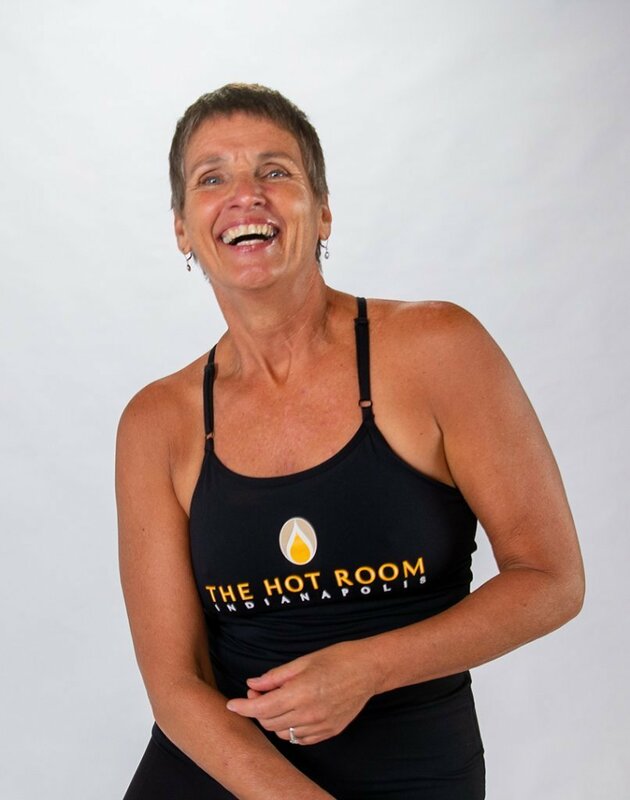 Laurie then took her next class in Columbus, Ohio, where she learned a studio had opened in Indy called “The Hot Room.” This yoga has become a major factor in Laurie’s life. It has helped to keep her arthritis at bay, her degenerative hips healthy and overall health great! Her advice to new students is to come in with an open mind and an open heart. Do the best you can and keep coming. This is one of the best things you can do for your body and mind. Standing Separate Leg Stretching. It feels so good to be stretching upside down! Oh so many…Ben and Jerry’s ChubbyHubby, absorbing vitamin D in the sun, wishing for snow and more snow. Hiking the White Mountains in Vermont, trying new chefs, and retreating to my home in the woods!